You don't need me to tell you that there is no shortage of Invaders games around, and the original arcade game has inspired countless other shoot-em-up space games since it's release in 1978. 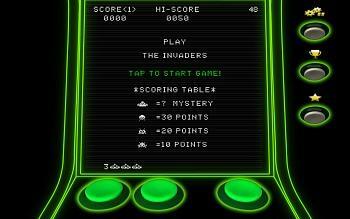 However, many releases just don't cut the mustard, so I wasn't expecting much from yet another free android shoot-em-up app, this one entitled "The Invaders". The game borrows heavily from the original game (it's basically a clone) but the designers have been careful not to copy the logos and artwork to avoid copyright infringement. On opening the game app you are presented with a funky, white arcade cabinet with three big green buttons, two to move your ship left and right and the other to fire missiles. Three silver buttons adorn the top of the cabinet which take you to options, a high score table and to exit the game. On opening the game app you are presented with a funky, white arcade cabinet with three big green buttons, two to move your ship left and right and the other to fire missiles. Three silver buttons adorn the top of the cabinet which take you to options, a high score table and to exit the game. 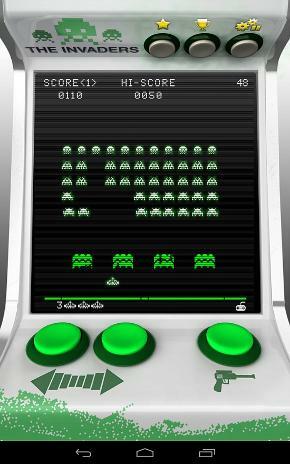 The game play area looks very much like the original game with green bases and white invaders. Indeed, this is one of the most authentic-looking non-official invaders games I've seen. It also plays just like the original, and the invaders move across and down the screen at more or less the same speed, and the legendary UFO still scrolls across the the top of the screen, thankfully. In fact, the game is well-suited to my 7" tablet with its oblong screen. You can also flip the game to play horizontally and in this mode the cabinet changes to a neon green colour - a nice touch. In options mode you can alter the CRT to make it low resolution like the original, and I much prefer the game in this mode as it looks way too polished in its modern mode. You can also turn off the sound, including the classic rumble sound - the rumble is a slight let down, but my tablet's tinny speaker doesn't help matters. The explosion effects (particles) can also be turned off, although I'm not sure why anyone would want to do this as they add a lot to the game. There is also an option to play with a gamepad. Overall, I was pleasantly surprised with The Invaders which manages to retain the look and feel of the original. The controls are very responsive and the funky arcade cabinet makes you feel as though you're playing in an 80s arcade, once again. The app is totally free and well worth downloading for a bit of retro fun every now and again. Impressive.